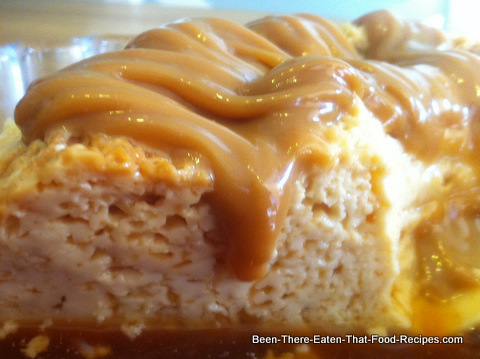 One of the simplest Argentine desserts, the Flan - at its basic - consists of a sweetened mix of eggs and milk, usually flavoured with vanilla essence, and topped with Dulce de Leche. 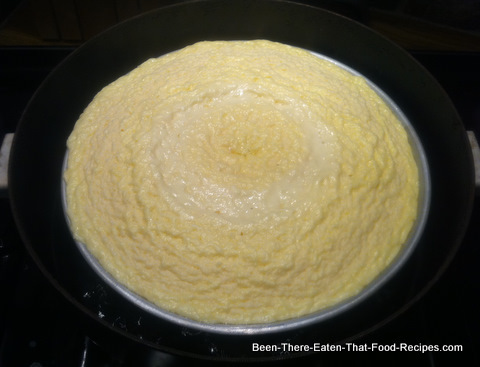 I can guarantee you something: with this recipe, at least one persone will ask you "how did you managed to get the little holes in the texture"? Believe me, it is always a topic of conversation!! I first heard my paternal grandfather ask this question to my mum when I was a little girl. And the last time was yesterday, when offering to some of my friends the Flan I prepared for these pictures, one of them ask the inevitable question...You will see, it is just a matter of time! Note: for different units, please click the Unit Conversion tool. - ~ 900ml milk (whole milk for a creamier taste, otherwise, semi-skimmed or skimmed). 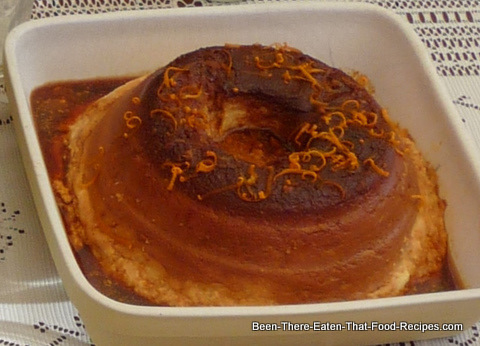 For a traditionally shaped Flan you need a savarin mould (the one in the pictures below). But if you don't have this kind of mould, just use any other suitable one. - we could place the mould on a deep roasting tin with some water, inside the oven. 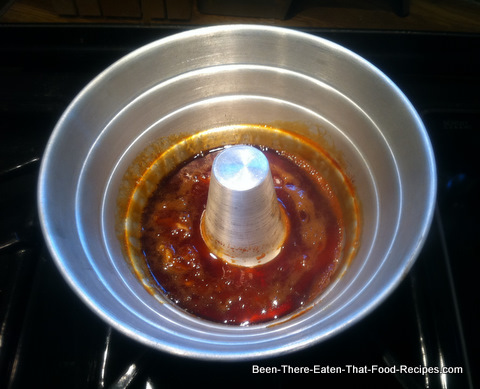 In the pictures here, I will show you the pan-lid bain-marie, but if you prefer to use the oven bain-marie, follow the alternative instructions for that effect, and start by preheating the oven at 120ºC (248ºF). 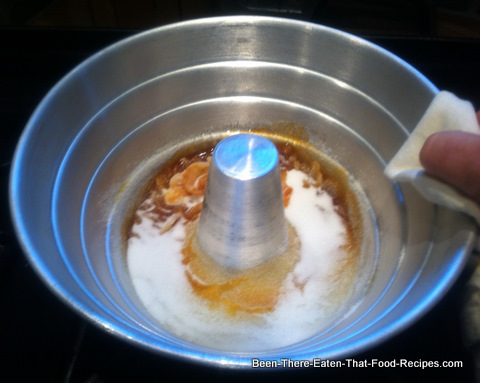 The first step consists in preparing the caramel. It is very important that you fully concentrate on this step to avoid burning it. 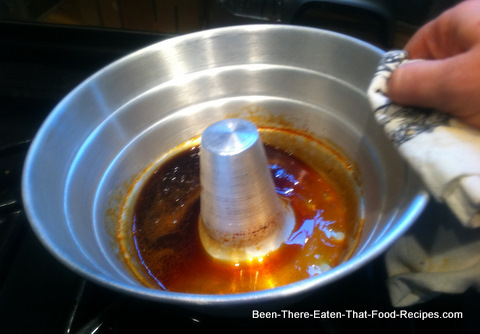 If burnt, the caramel is ruined and you will have to start all over again. 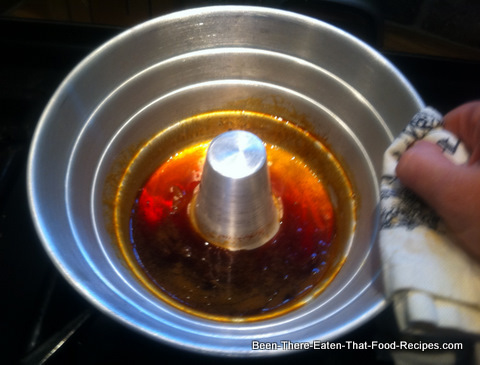 Otherwise, the strong taste and smell of burnt sugar will spoil your Flan, and you don't want that to happen! Place the mould on a medium heat on the cooker. 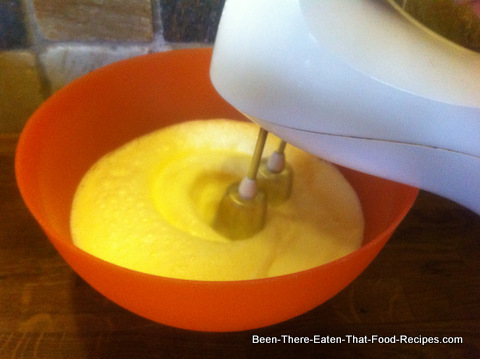 Add 5 tablespoons of sugar to the hot mould. Once hot, the sugar will start to caramelise. From time to time shake the mould a bit to ensure that sugar is not burnt. 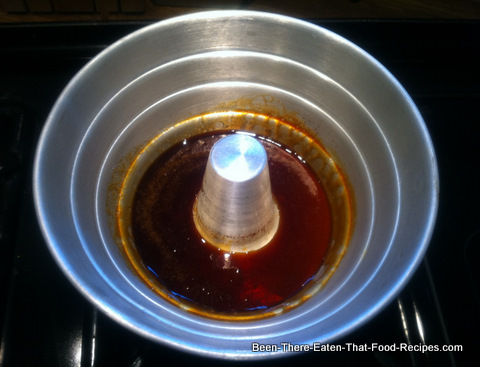 Note: The caramel reaches a temperature of over 160ºC (>320ºF), so please be very careful and avoid burning yourself! ...and without any sugar lumps. ...until the caramel is all homogeneous. Remove the mould from the heat. 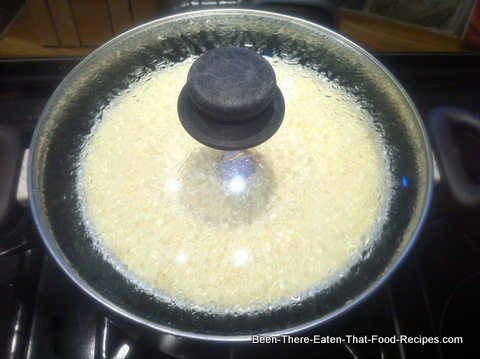 If you are using the pan-lid bain marie, place the pan on the medium heat now and add about 2cm of water to set the bain-marie. 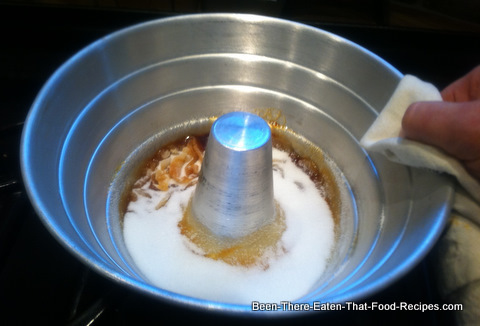 Place the mould with the caramel inside the pan with the water, and keep them on medium heat. 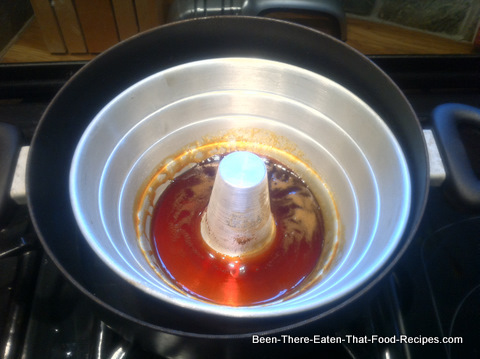 Or, if using the oven bain-marie, add water in a deep roasting tin and place the mould with the caramel inside it, making sure that the water cover at least 1/3 of the height of the mould. Place into the oven. Either way, always make sure that the water is not completely evaporated, and carefully refill if needed. 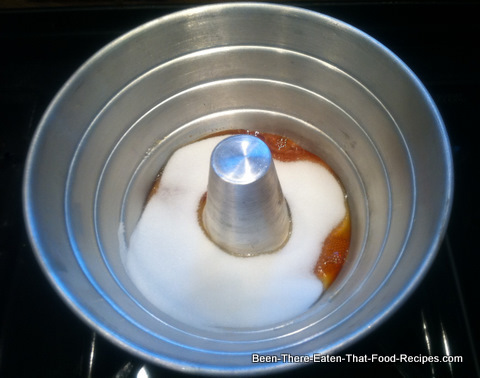 Add the remaining 5 tablespoons of sugar on top. 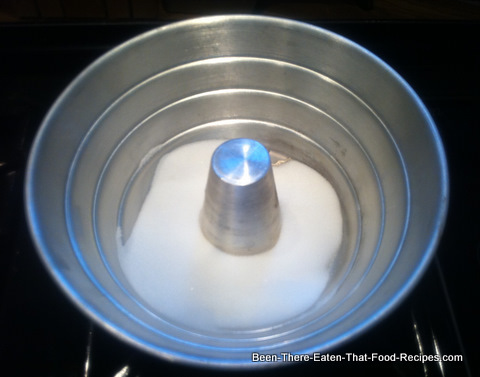 ...and mix together until foamy. 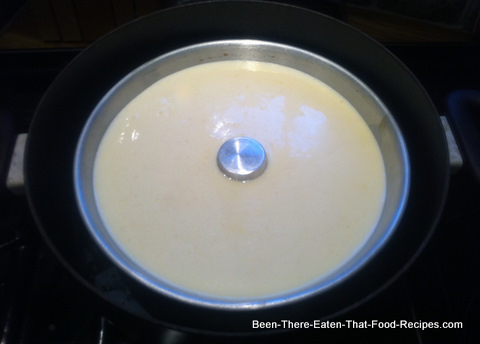 ...without touching the borders of the pan or tin. 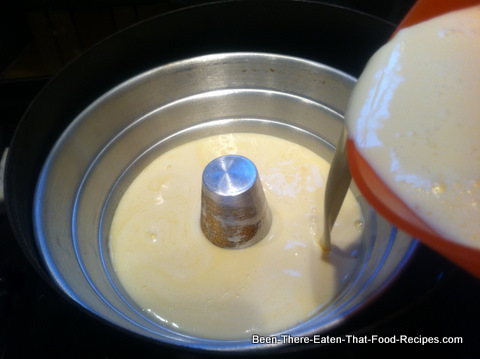 Complete the volume of the mould with extra milk if needed, leaving a margen of 2cm from the top. 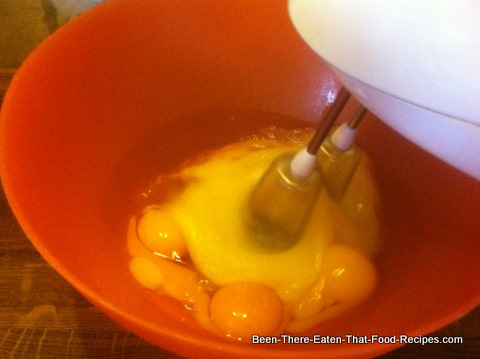 Gently mix it together. It will be in total about 900ml of milk depending on mould size. ...and leave for about 45'-50' to cook. 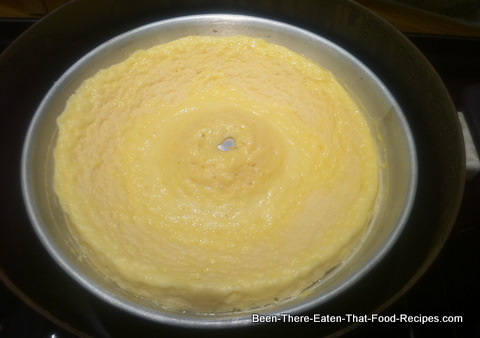 Or, place inside the oven and bake for about 40' until when inserting a knife in the centre it comes out clean, if you are using the oven bain-marie. When ready, it will look set and "risen". Leave it to cool down, with the lid off or outside the oven. Once cooler, it will look a bit shrunk. 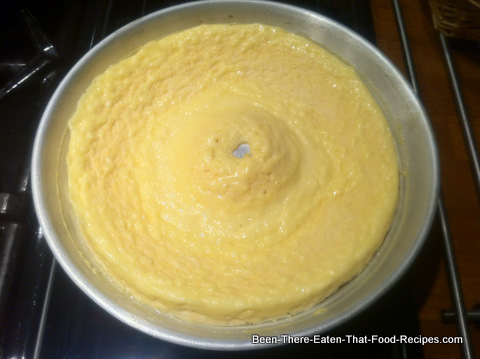 Carefully to avoid burning yourself, remove the Flan from the pan or tin and now leave it to cool down completely before bringing it to the fridge. 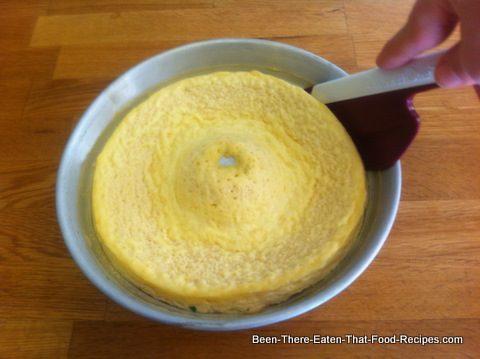 Once cool, use a spatula or dull knife to gently separate the edges from the mould. It shouln't be difficult, since, after shrinking a bit, the edges should already be quite detached. 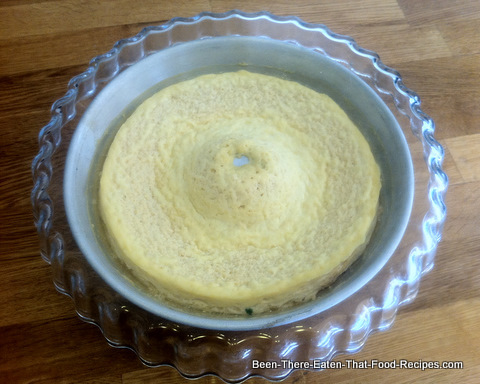 Get ready to invert the Flan, placing a deep serving dish on top of the mould. 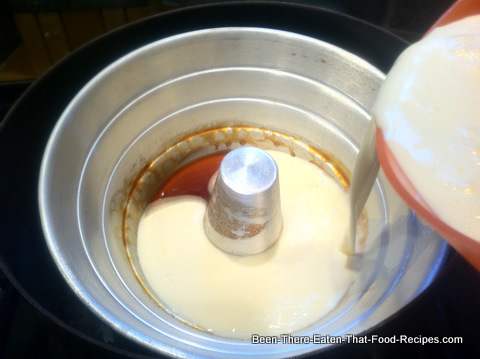 Place one hand at the bottom of the mould and the other hand on top of the serving dish, keeping them firmly together while quickly making an inverting movement, ending up with the Flan on the serving dish. 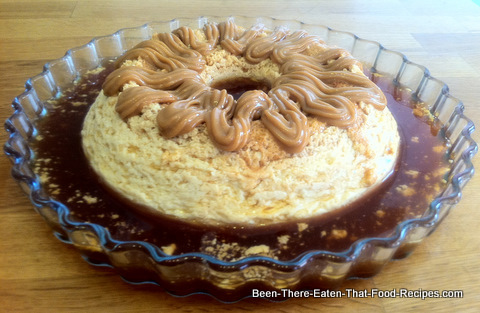 Decorate with Dulce de Leche or serve with Dulce de leche at a side. Tip: If harden caramel was stuck in the mould, you can release it by adding some water to the mould and placing it on a low heat, add some gently movement and help with a spoon. Let it cool down, and then add it to the rest. 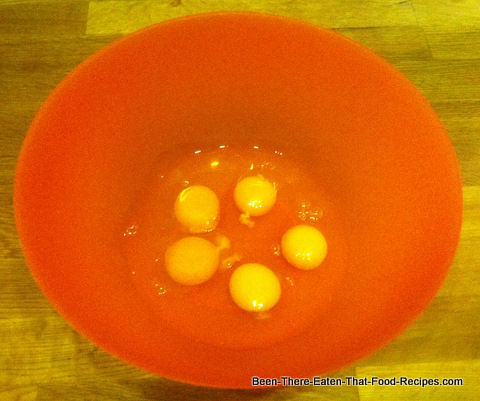 Having the basic recipe mastered, the variations are limitless! The trick is to mantain the proportions. For a softer and creamier texture, try this version. Prepare the caramel as explained above. 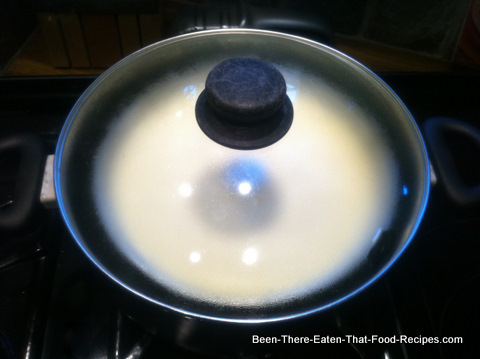 For the mix, simply reduce the 5 tablespoons of sugar to 3; and take 1 x 397g can of light/sweetened condensed milk into account when measuring the milk (ie, 200ml condensed milk + 700ml milk). This variation doesn't display any little holes in its texture but the smoothness is sublime! For an Orange flavoured variation, we only need 4 oranges. 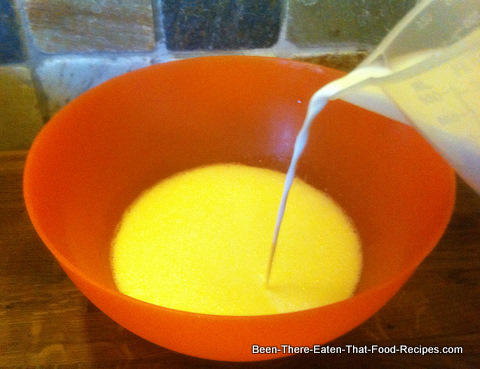 Finely zest the oranges and use them to flavour the Flan instead of the vanilla essence. Leave some zest aside for decoration. 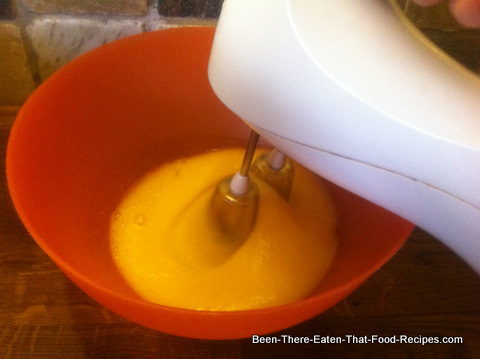 Juice the oranges and deduct this volume from the total milk volume (ie, 200ml orange juice + 700ml milk). 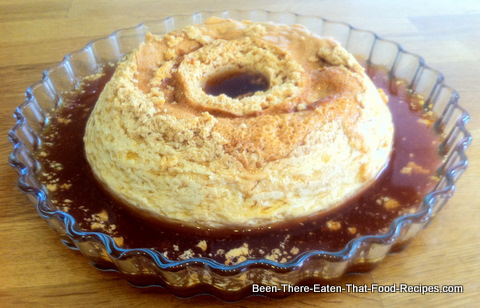 You can even combine variations and have, for instance, an Orange Condensed Milk Flan. Why Not??? The orange versions taste great when served with Chantilly Cream (better than with Dulce de Leche in my opinion). - Retun from Flan to Argentine Food. 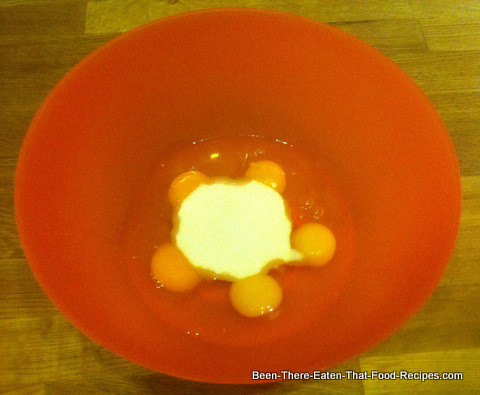 - Return to Food Recipes.